10 Models Available, from 70 bar to 2.900 bar. Engineered and designed for easy operation. Compact and lightweight steel frame for full protection and handling. Fully integrated and protected pressure gauge. Clearly labelled controls for improved safety. Supplied with air inlet connector, air filter, air pressure regulator, air lubricator, air pressure gauge, air pressure limit valve, pump on/off control, oil pressure gauge. All pumps work with water. All pumps supplied complete with a full test certificate. High pressure fittings and any length of high pressure hose available from stock. Working Air Pressure: 1.7 bar to 6.9 bar. 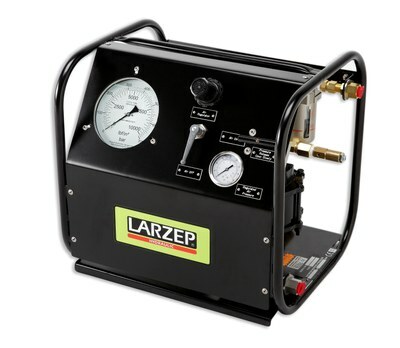 Air Consuption: 0.79 m³ per minute / 28 scfm. Air Inlet Port: 1/2″ NPTF female. Dimensions: Length 485 x Width 420 x Height 450 mm. Options: Chart recorders – Integral or free standing, Chart recorder pens and charts, Stroke counter, Stainless steel framework, External connection to liquid supply to increase available fluid during testing. High flow pumps Hydrotest Pumps (Double the speed of the standard one). Tailor made bespoke Hydrotest Sytems / Test Rigs for multiple testing.